Crimson Beauty Red is an excellent substitute for the Scarlet Flame when it is not available. Bright scarlet red flowers with hints of fuchsia cover the evergreen perennial during spring. 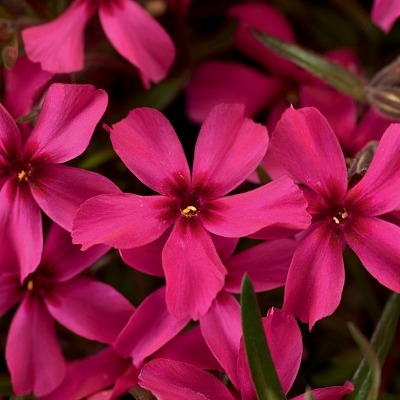 Longer spring flowering than many creeping phlox varieties, the Scarlet Flame Creeping Phlox is a showy groundcover that works beautifully for garden borders, rock gardens, hillsides, around mailboxes, containers and as a grass substitute in smaller areas. Creeping Phlox is easy to grow. Clip blooms that begin to wither or mow over when blooming has stopped. Like petunias, when the blooms touch the foliage they will burn and sometimes stunts the plants. Creeping Phlox are drought tolerant, deer resistant, and pet friendly. Scarlet Red Creeping Phlox grows in a 3.5 inch pot. Orders shipping to CA and AZ will be bare rooted before being prepped for shipping.